The Doctor of Philosophy (Ph.D) at Razak Faculty of Technology and Informatics was introduced to complement existing school-based research master’s programme. This new Ph.D programme is a multi-disciplinary research award degree for those who already hold a master’s degree (in any ­eld) and who would like to expand and upgrade their knowledge. This programme produces human capital, which is not only intellectual and competent in modern and advanced technology but also versatile and capable of handling problems in real-life situations. Successful completion of the programme will prove that candidates has successfully completed a course of research training. The Ph.D thesis is be expected to make a major contribution to the discipline by way of new knowledge. Candidates must have a Master’s degree or equivalent from recognized / accredited universities in the relevant disciplines. 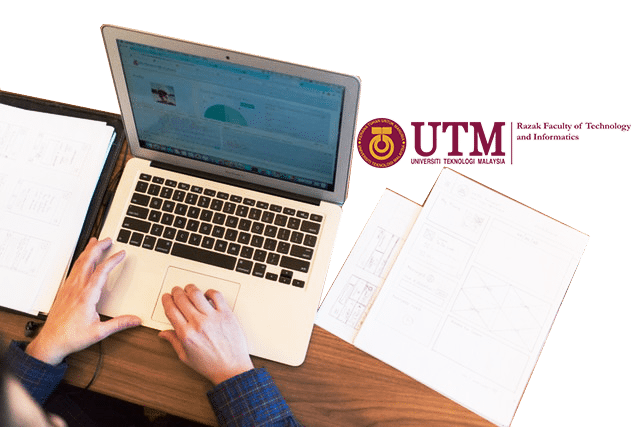 Potential students are encouraged to seek further information about the research expertise of academics staff through the UTM Razak School’s website, brochures or relevant departments. Materials and Material Processing, Manufacturing Process and System, Quality and Robust Engineering, Operation Management and Industrial Engineering, Occupational Safety and Health, Ergonomics, Noise and Vibration, Ultrasonic Vibration, Finite Element Simulation and Modelling, Instrumentation and Control, Aeronautic Engineering and Fluid Mechanics, Maintenance Engineering and Condition Monitoring. Biosignal and Image Processing, Telematics and Wireless Network, Computer Networking, Broadband Multimedia, Photonics and Fiber Optics System, Power and Control System, Artificial Intelligent and Pattern Recognition. Structural Mechanics and Analysis, Concrete and Precast, Construction Management, Project Management, Building Infrastructure, Procurement Management, Contract Management, Performance Benchmarking, Groundwater Engineering, Surface Water Hydrology, Fluid Mechanics, Hydraulics and Hydrology, Water Resources Engineering and Management, Water Quality, Offshore Structure and Analysis, Environmental Engineering, Water and Wastewater Treatment, Environmental Management, Solid Waste Management, EIA, LCA, Geospatial Intelligent, LIDAR, Remote Sensing, GIS, Geomorphology, Hydrographic Surveying, Marine Mapping. Semiconductor Physics, Nanostructure, Thin Film, Superconductivity, Statistical Modelling in Hydrology, Extreme Rainfall Analysis and Modelling, Statistical Downscaling with respect to Climate change, Spatio-Temporal Modeling in Hydrology, Applied Statistics, Wave Mechanics, Graph Theory Application Model, Location System, Computational Maths, Mathematic Education, Mathematical Thinking, Education and Training at Workplace, Mathematic at the Workplace, Assessment of Learning, Curriculum Development, Adult Learning. Land Economics, Retail Marketing, Halal Trading, Foreign Language Education, Comprehension, Language Learning & Teaching, ESL, ELT, Educational Psychology, Human Resource Development, Information Technology Management, Management Information Systems, Ethics in Computing, Decision Support Systems, Organizational Behaviour, Training and Development, Workplace Learning, Organizational.